Just a reminder that My Thoughts On… posts may contain spoilers, so if you haven’t seen the film in question, please skip down to Why Should I See This Film? which is spoiler-free! When I’m asked what my favourite film, I might um and ah a little bit, but I usually come down on the side of Mary Poppins. It holds a very special place in my heart, so I was so excited to see Saving Mr Banks when it was announced. I didn’t manage to get to the cinema to see it, but I finally watched it a couple of weeks ago, and I wasn’t disappointed at all. I loved it. For those of us who are fans of the 1961 film, it’s the perfect companion, watching how it all came about, hearing the fabulous songs, and getting an insight (albeit a slightly Disney-fied insight) into the life of the author who created the eponymous nanny. Emma Thompson is amazing in everything she does, and she is so perfectly suited to this role. She manages to bring a huge amount of likeability to a character who is stubborn, rude and cantankerous. We need to feel sympathy for her at the same time as feeling exasperated by her, and it’s hard to imagine anyone as adept at playing this kind of role as Emma Thompson. She was robbed in last year’s Oscar nominations. Similarly fabulous performances come from Tom Hanks, Paul Giamatti and Colin Farrell. I particularly loved Giamatti’s performance as Travers’ chauffeur, Ralph. Their relationship really touched me; she trusted him as little as anyone else affiliated with the Disney corporation at first, but he won her over, and it was a beautiful moment when he spoke to her about his daughter’s disability. I also loved Bradley Whitford, BJ Novak and Jason Schwartzman, playing the creative team working on Mary Poppins and trying their hardest not to lose their tempers with Mrs Travers. 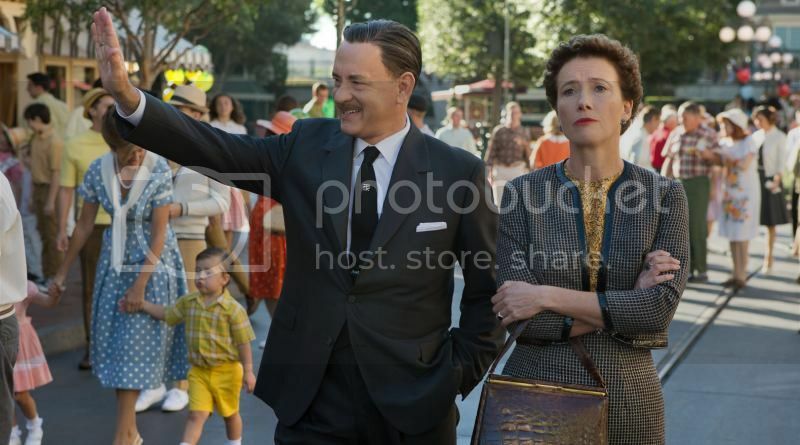 Given that this is a Disney film about a Disney film, there was always the worry that Saving Mr Banks would end up mawkish and sentimental, but it avoids those traps almost entirely. It stirs the emotions, and it did make me cry, but it wasn’t soppy or over the top. It has received some criticism for seemingly showing P.L. Travers as having a change of heart about Mary Poppins in the end, and I think the scene where she ends up dancing to Let’s Go Fly a Kite is rather Disney-fied, and almost definitely never happened. But I think that it does a pretty good job at showing that she entered into the whole endeavour because she had to, and not because she wanted to. I think it’s the perfect mix of real life and dramatisation, and I just loved it. I am the first person to appreciate a sideways glance at the audience from within a film, especially when it’s a reference to a film that I love. The flashbacks to P.L. Travers’ childhood provided lots of these, and to begin with, I was on board, but by the end of the film, I felt as though they were being shoehorned in just a little bit. By the time little Ginty’s Aunt Ellie was saying “spit spot!” I was just about done. I just wanted it all to be a bit more subtle than that. Why Should I See This Film? I feel as though this is one of those films that I am so late to the party with that most people will have seen it already! But if there’s a chance you haven’t, I would say that fans of Mary Poppins need to see it immediately. It evokes such a wonderful sense of time and place – 1960s Disney World – that it’s a joy to watch. And the performances, most notably of Emma Thompson as P.L. Travers herself, are just breath-taking. Yeah – although it was slightly Disneyfied, I think it was fairly faithful to what happened!